LONGYANGXIA, China (Reuters) – At dawn, high on the Qinghai-Tibetan plateau, a Buddhist monk in saffron robes chants blessings over limber athletes preparing to run 100 kilometres across sand dunes, rivers and ravines. The crowd of sporty, middle-class urbanites had spent thousands of yuan to travel to Longyangxia Reservoir in northwestern Qinghai province for an “ultramarathon” – a drastic change from a decade ago, when few Chinese raced even in cities and gear might include jeans and flip-flops. Governments and companies in such far-flung mountainous regions have high hopes that this relatively small but fast-growing crowd of trail runners can bring big bucks that will boost business prospects. “When I arrived, I thought Longyangxia was quite remote; the scenery was beautiful but it was isolated and economically lagging,” said Ying Miyan, chairman of China’s largest salmon fishery, Qinghai Minze Longyangxia Ecological Aquaculture Co., which is sponsoring the Super Salmon 100km Ultra-Marathon Challenge there. Longyangxia, a sleepy waterfront town of about 3,000 people, has in the last decade poured more than 1.6 billion yuan ($233 million), much of it from private investment, into bike tracks, scenic areas and refurbished hotels in an attempt to lure sporty travellers. Ultramarathons, which are many times longer than the traditional 42.2-kilometre marathon, are usually “trail” runs, sending racers across countryside terrain. Officials in Longyangxia declined to be interviewed. But the Super-Salmon trail race, in its first official year, brought in just over 500 runners, filling the town’s lone hotel for 300 yuan per night, with some guests staying for a few days after the event. Ying’s company provided salmon for the athletes to eat, prize money of up to 15,000 yuan, and presented the male 100km winner with his body weight in salmon as an additional reward. State media articles have called efforts to use sporting events to attract tourists a success, saying they have brought 10,000 visitors to the lake so far this year, already double the total for 2017. The National Sports Bureau recognised Longyangxia as a “sports and leisure speciality town” in 2017, Qinghai’s only town on the bureau’s list of 100. Beijing has called for 1,000 such towns to be created by 2020 in a nationwide drive to develop sustainable industries in the hinterlands, but doubts remain over whether all the projects will pay off. The benefits to Longyangxia, for instance, are still mostly aspirational; in early August, the town centre was a ring of empty buildings and an unoccupied karaoke hall, while the market street was a pile of rubble. Yu Yanmeng, a race organiser from Beijing-based adventure sport company Xinzhi Exploring Group, said its events rarely make money. But the company hopes that will change as numbers grow. “These races and sports activities, once they get going, can expand the influence of local tourism and scenery to create a calling card for the city, make them better known and pull up economic growth,” he said. The growing number of trail races – there were about 250 in the first half of this year, compared with less than 30 in all of 2015 – has also piqued the interest of specialist sports apparel brands that want to tap into the Chinese market. 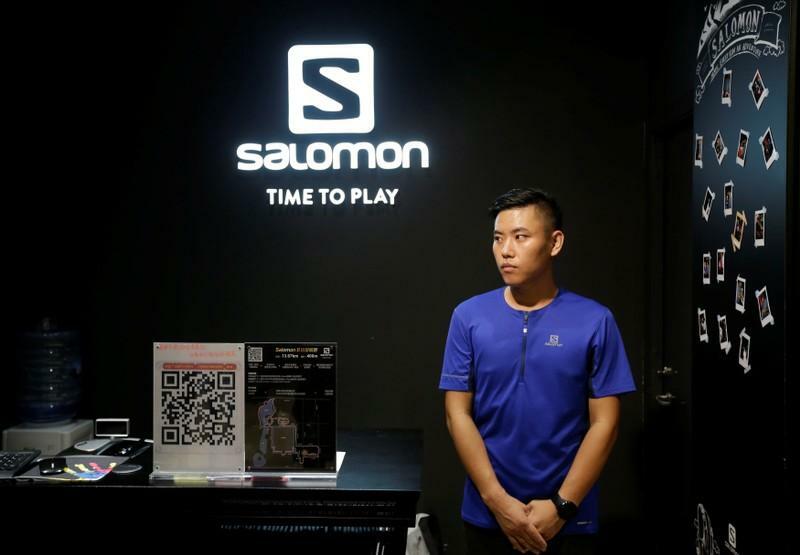 China net sales at Amer Sports Oyj , which owns the world’s biggest trail-running brand, Salomon, rose 23 percent in the first half this year, compared with a gain of 13 percent in 2017. “Our goal today at Salomon is to catch and to convert all the people that are running today in China (to trail running),” said Anthony Marguet, China commercial manager at Salomon, adding that he expects the number of trail runners in China, currently about 150,000, to double or triple in the next five years. Its premium S/lab trail running shoes, which cost 1,898 yuan, account for 17 percent of its footwear sales in China, but only 3 percent of its global sales, Marguet told Reuters. The company sponsors 20 elite athletes in China and more than 30 trail runs every year. “Passion for fun, cool and distinctive sports is getting higher and higher, and it’s driving the (Chinese) market faster we could ever have imagined,” Stefan Schwartz, Amer’s general manager for APAC, said in April. China’s General Administration of Sports forecasts 10 million runners will take part in domestic races annually by 2020, when the size of the industry will exceed 120 billion yuan. Abroad, Chinese racers will be the fifth-largest nationality at this year’s Ultra-Trail du Mont-Blanc, the Tour de France of trail running, which has set up a special welcome party and commentary for them. Zhao Fan, Chinese distributor of U.S. trail running shoe-maker Altra Running, expects sales at his store next to Beijing’s Olympic Forest Park to double this year. As trail running prospers in China, international brands may face competition from local startups, Zhao said. But he added that it would be healthy for the industry. Many trail runners build their lives, and spending habits, around the sport. He Runyu, an energetic business management professor at Beijing’s Science and Technology University, became serious about long-distance running around the same time he gave up meat and drinking. He now averages about 10 races a year, just for fun. He estimates he spends tens of thousands of yuan every year on running. At the Longyangxia race, he had to drop out with an ankle injury, but put more than 3,000 yuan into the trip. “Everyone always thinks that running is really cheap. Before I started I thought the same, but I realized running is very expensive,” he said, adding that the main cost was the travel itself. When Dou Jianyun, 45, wanted more time for trail running, she took a job in sales at a Beijing-based sportswear startup called Engine Bird. Dou was one of only three female runners to make it to the finish line for the 100km Longyangxia race. She brought three GPS systems with her to Qinghai and bought new walking poles to guard against injury on the rocky trails. “I could still live if I couldn’t run, but I would not be happy,” Dou said.